Fresh from nailing our SSD supertest with its rather spiffing M500 SSD drive (which packs parent company Micron's memory might), we've got Crucial's latest RAM modules designed for Haswell. The recently launched Sport XT series is made up of high performance DIMMs aimed at the usual suspects: namely gamers and enthusiasts. Well, according to Crucial, anyway. 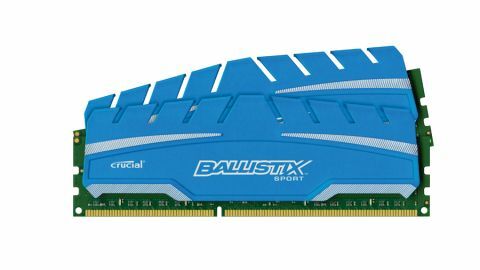 In complete contrast to the last Sport modules we looked at - the very low-profiled Ballistix Sport VLP memory, which could practically fit under any old CPU cooler - the Sport XT series goes back to a full blown, meaty heatsinked design. Despite being beloved by all producers of high performance memory, it's a design that can often be a pain to fit with a large third-party cooler installed. You know, the kind of cooler many gamers and enthusiasts kit out their rigs with. With the new line comes a new design of heat spreader that covers most of the PCB. The new design is comprised of two thin side panels of blue finished aluminium, each with a subtle curve to the top-edge and a thin ribbon of thermal tape in contact with the memory chips. Currently, the Sport XT range is made up of two speeds of memory: 1,600MHz (PC3-12800) and 1,866MHz (PC3-14900) in 4GB and 8GB density modules. The 1,600MHz modules are CAS 9-rated, while the 1,866MHz pieces are rated at CAS 10, the company's first kit to carry this rating. Both speeds of memory are available in capacities up to 32GBs. Like the Corsair sticks - once installed and fired up in our test mobo - the memory was running at 1,333MHz at 1.5v, with 10-10-10-30 1T timings. If left to its own devices, that's the speed the memory would run at in Auto mode. And again, it demonstrates the value of XMP - a quick delve into the BIOS and the memory was running at its labelled 1,866MHz rate. We confirmed this in CPU-Z, which incidentally showed the XMP profile of 1,866MHz was not the highest speed profile built into the memory - it was in fact closer to 2,066MHz. Having been surprised by the overclocking chops of the Sport VLP we looked at a while back, it was interesting to see what these modules - with much bigger heatsinks - were capable of. With a dab of extra voltage to help with stability, the fastest our particular modules would go was 2,200MHz. No matter what we tried, the motherboard refused to boot up above this. So it performs well, but what about its price tag? When up against comparable Crucial 16GB kits - similarly using a pair of 8GB modules - the Sport XT is actually the cheapest kit the company offers. But when it comes to comparing it to the outside opposition, then things don't look quite as rosy. For example, it's possible to buy a 16GB kit of Corsair's latest, highly overclockable Vengeance Pro memory - running at 2,133MHz out of the box - for just a little more than the Sport XT.